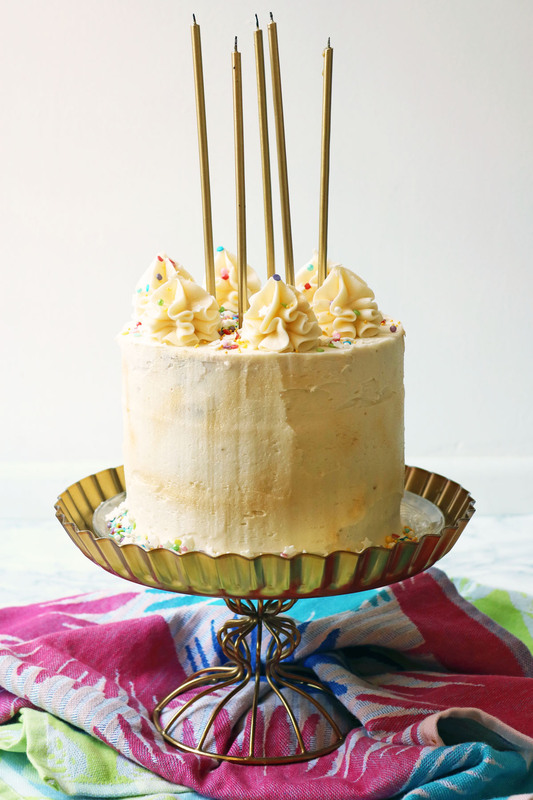 This light and fluffy vegan celebration cake is fit for any special occasion, it just so happens that this week was my birthday! Is it a birthday if you don’t have a birthday cake?! I think not… The second I agreed to do Veganuary I knew I was going to have to start experimenting in the kitchen because there was no way I was going to go without cake on my birthday. It turns out vegan cake is really easy to make! You don’t need any fancy ingredients and there’s no apple sauce or banana in it tainting the flavour. This is just a classic, vanilla celebration cake that can be flavoured or decorated any way you like. I wanted each layer sandwiched with raspberry jam, smothered in vanilla buttercream, topped with even more ruffles of buttercream, sprinkles, sprinkles and some more sprinkles! Each bite is light, fluffy and sweet. The tart and sticky raspberry jam providing balance. It’s a classic combination that will never get old. This isn’t the first vegan bake I’ve posted on the blog since starting my plant based diet. My tahini and dark chocolate cookies were delicious but they relied on a seed butter and oil in place of dairy. I wanted to keep this recipe as simple as possible using the same type of ingredients and the same method that you would use if you were making a regular celebration cake. Instead of butter I used Flora dairy free. It’s a vegan spread made from seeds yet somehow, has this amazing rich, buttery flavour. I’m yet to find another dairy free butter substitute which is SO close to the real deal. It acts in the exact same way as butter and because its soft and spreadable it makes it ideal for using the all in one method. You just add it to a big mixing bowl along with the sugar, flour, vanilla, dairy-free milk, a little lemon, beat it well and bake. It’s that simple! 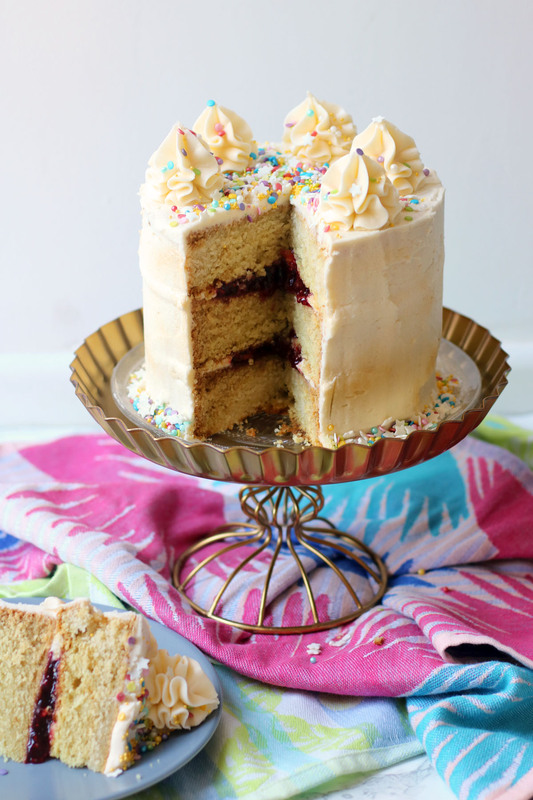 This light and fluffy sponge cake is perfect for a birthday or similar celebration! Line three 6 inch cake tins with grease proof paper and place to one side. Add the dairy free spread, caster sugar, flour, baking powder and vanilla paste into a large bowl. Beat well using an electric whisk, adding the dairy-free milk slowly. As soon as a smooth batter has formed, stop whisking and divide between the three cake tins. Leave the cakes to cool in the tin for 5-10 minutes before transferring out on to a wire rack to cool completely. Beat together the dairy free spread and the icing sugar until smooth. It needs to be smooth and soft enough to pipe. Add a little milk if its not quite soft enough. Spread a little buttercream on a cake board or cake plate and place down the first layer of sponge cake. Fill an icing bag with a quarter of the icing and carefully pipe a ring of buttercream around the top of the sponge cake layer. Fill the middle of the buttercream ring with half of the raspberry jam. Place the next sponge layer on top and press down gently. Pip another ring of buttercream on top of the second sponge layer and fill with raspberry jam. Top with the final layer of sponge cake and press down gently. Use any buttercream left in the piping bag to fill any gaps between the layers. Using a spatula, start covering the sides of the cake with buttercream trapping in as many crumbs as possible. Spoon half of the icing on top of the cake and spread out over the sides of the cake. Cover the top and sides of the cake with the remaining two thirds of buttercream and smooth out carefully. Spread sprinkles around the base and top of the cake. Place an open star nozzle into a second piping bag and fill with the remaining buttercream. Pipe swirls on the top of the cake. To finish, spray with gold lustre dust. If you're unsure whether the cakes are cooked, insert a skewer into the centre of the cake. If it comes out clean and dry then they are done. This cake is best stored in an air tight container and enjoyed within 3 days of baking. Love the recipe to this light and fluffy sponge cake. This cake looks delicious and love the option that it is Vegan. This stunning cake is ALL about celebration!!! A very happy birthday to you, and congrats on making such a gorgeous, delicious-sounding cake that’s VEGAN !!! LOVE!!! What a pretty looking cake! Handy to have a vegan option too. Ooooh I have some vegans in my life that would love this! I’ve never tried vegan baking but I may just have to give it a shot! This looks amazing, and so professionally finished as well. Great to see how easily you can create great vegan versions. Awesome job of the cake. You make vegan baking so simple as it should be. Belated Happy Birthday to you too.